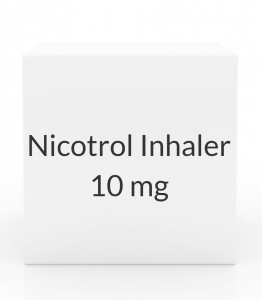 USES: This medication can help you quit smoking by replacing the nicotine in cigarettes. The nicotine in tobacco is an important part of cigarette addiction. When you stop smoking, your nicotine levels drop quickly. This drop can cause withdrawal symptoms such as craving tobacco, nervousness, irritability, headache, weight gain, and difficulty concentrating. Using the inhaler can replace the hand-to-mouth habit of smoking. Stopping smoking is hard and your chance of success is best when you are ready and have made a commitment to quit. Nicotine replacement products are part of a total stop-smoking program that includes behavior change, counseling, and support. Smoking causes lung disease, cancer, and heart disease. Stopping smoking is one of the most important things you can do to improve your health and live longer. HOW TO USE: Read the Patient Information Leaflet provided by your pharmacist before you start using your nicotine inhaler and each time you get a refill. Follow all the directions for use carefully. If you have any questions, consult your doctor or pharmacist. It is very important to stop smoking completely while using this nicotine product. Insert a cartridge into the mouthpiece and inhale the medication by quickly puffing on the mouthpiece for four 5-minute sessions or continually for about 20 minutes. Although using the inhaler is like smoking a cigarette, you do not need to inhale deeply as you would a cigarette for the medicine to work. The medicine works in the mouth and throat, not in the lungs. Avoid acidic food and drink (e.g., citrus fruit, coffee, juices, carbonated drinks) for 15 minutes before inhaling this medication. After using the inhaler for a total of 20 minutes, remove the used cartridge and throw it away out of reach of children and pets. The mouthpiece is reusable. Clean with soap and water. When you quit smoking, start using a nicotine cartridge whenever you crave a cigarette. Usually, you will use at least 6 cartridges each day for the first 3 to 6 weeks or as directed by your doctor. Do not use more than 16 cartridges in a day. Your doctor may direct you to use this product on a regular schedule as well as at times when you have the urge to smoke. Regular use can help your body get used to the medication and decrease side effects such as sore throat. The best dose for you is the dose that decreases the urge to smoke without side effects from too much nicotine. Follow your doctor's orders carefully. Your dose will need to be adjusted to your needs, including smoking history and medical condition. After you have stopped smoking and you have reached the best dose and schedule for you, continue at that dose. Usually, after about 3 months, your doctor will help you gradually reduce your dose until you are no longer smoking and no longer need nicotine replacement. This medication may cause withdrawal reactions, especially if it has been used regularly for a long time or in high doses. In such cases, withdrawal symptoms (such as tobacco cravings, nervousness, irritability, headache) may occur if you suddenly stop using this medication. To prevent withdrawal reactions, your doctor may reduce your dose gradually. Consult your doctor or pharmacist for more details, and report any withdrawal reactions immediately. Tell your doctor if you have not been able to quit smoking after using this product for 4 weeks. Some smokers are unsuccessful the first time they try to quit. You may need to stop using this product and try again later. Many people who cannot quit the first time are successful the next time. SIDE EFFECTS: Headache, nausea, mouth/tooth/throat pain, cough, runny/stuffy nose, change in taste, heartburn, hiccups, sweating, or diarrhea may occur. Common nicotine withdrawal symptoms can occur when you stop smoking and include dizziness, anxiety, depression, or trouble sleeping, among others. If any of these withdrawal symptoms or side effects persist or worsen, tell your doctor or pharmacist promptly. Remember that your doctor has prescribed this medication because he or she has judged that the benefit to you is greater than the risk of side effects. Many people using this medication do not have serious side effects. Serious side effects are more likely if you continue to smoke while using this product. Do not smoke while you are using this medication. Stop using this medication and tell your doctor immediately if any of these unlikely but serious side effects occur: severe dizziness, mental/mood changes (e.g., irritability, trouble sleeping, vivid dreams), numbness/tingling in hands/feet, swelling hands/ankles/feet. Stop using this medication and seek immediate medical attention if any of these rare but very serious side effects occur: chest pain, confusion, severe headache, fast/irregular/pounding heartbeat, slurred speech, weakness on one side of the body. A very serious allergic reaction to this drug is rare. However, seek immediate medical attention if you notice any symptoms of a serious allergic reaction, including: rash, itching/swelling (especially of the face/tongue/throat), trouble breathing. This is not a complete list of possible side effects. If you notice other effects not listed above, contact your doctor or pharmacist. In the US - Call your doctor for medical advice about side effects. You may report side effects to FDA at 1-800-FDA-1088. In Canada - Call your doctor for medical advice about side effects. You may report side effects to Health Canada at 1-866-234-2345. PRECAUTIONS: Before using this product, tell your doctor or pharmacist if you are allergic to it; or if you have any other allergies. This product may contain inactive ingredients (such as menthol), which can cause allergic reactions or other problems. Talk to your pharmacist for more details. This medication should not be used if you have certain medical conditions. Before using this medicine, consult your doctor or pharmacist if you have: uncontrolled/worsening chest pain, recent heart attack, irregular heartbeat (serious arrhythmias). Before using this medication, tell your doctor or pharmacist your medical history, especially of: blood vessel disease (e.g., Raynaud's disease, stroke), breathing problems (e.g., asthma, emphysema), diabetes, heart disease (e.g., chest pain, heart attack), high blood pressure, liver disease, severe kidney disease, stomach/intestinal sores (peptic ulcers), certain adrenal problem (pheochromocytoma), overactive thyroid (hyperthyroidism). Nicotine and smoking may harm an unborn baby. If you are pregnant, try to stop smoking without using a nicotine replacement product if possible. During pregnancy, this medication should be used only when clearly needed. Discuss the risks and benefits with your doctor. Nicotine from smoking and from this medication passes into breast milk and could have undesirable effects on a nursing infant. Smoking near an infant can also harm the infant. Consult your doctor before breast-feeding. DRUG INTERACTIONS: Your doctor or pharmacist may already be aware of any possible drug interactions and may be monitoring you for them. Do not start, stop, or change the dosage of any medicine before checking with your doctor or pharmacist first. Before using this medication, tell your doctor or pharmacist of all prescription and nonprescription/herbal products you may use, especially of: medications for high blood pressure (e.g., beta blockers such as labetalol, prazosin), bronchodilators/decongestants (e.g., isoproterenol, phenylephrine), bupropion, other nicotine products (e.g., patch, tobacco). Stopping smoking can change the way the liver removes certain drugs from the body (e.g., acetaminophen, caffeine, insulin, oxazepam, pentazocine, propoxyphene, propranolol, theophylline, tricyclic antidepressants such as amitriptyline/imipramine, "water pills"/diuretics such as furosemide). Tell all your doctors and pharmacists that you are quitting smoking. This document does not contain all possible interactions. Therefore, before using this product, tell your doctor or pharmacist of all the products you use. Keep a list of all your medications with you, and share the list with your doctor and pharmacist. OVERDOSE: This product may be harmful if swallowed. If swallowing or overdose is suspected, contact your local poison control center or emergency room immediately. US residents should call the US National Poison Hotline at 1-800-222-1222. Canada residents should call a provincial poison control center. Symptoms of overdose may include: confusion, drooling, seizure, slow/shallow breathing, hearing problems. MISSED DOSE: If you are using this on a regular schedule and you miss a dose, use it as soon as you remember. If it is near the time of the next dose, skip the missed dose and resume your usual dosing schedule. Do not double the dose to catch up. STORAGE: Store at room temperature at or below 77 degrees F (25 degrees C) away from light and moisture. Do not store in the bathroom. Keep all medicines away from children and pets. This medication will not work well if it is too cold. Keep the medication in an inside pocket or warm area during cold weather. Do not flush medications down the toilet or pour them into a drain unless instructed to do so. Properly discard this product when it is expired or no longer needed. Consult your pharmacist or local waste disposal company for more details about how to safely discard your product.